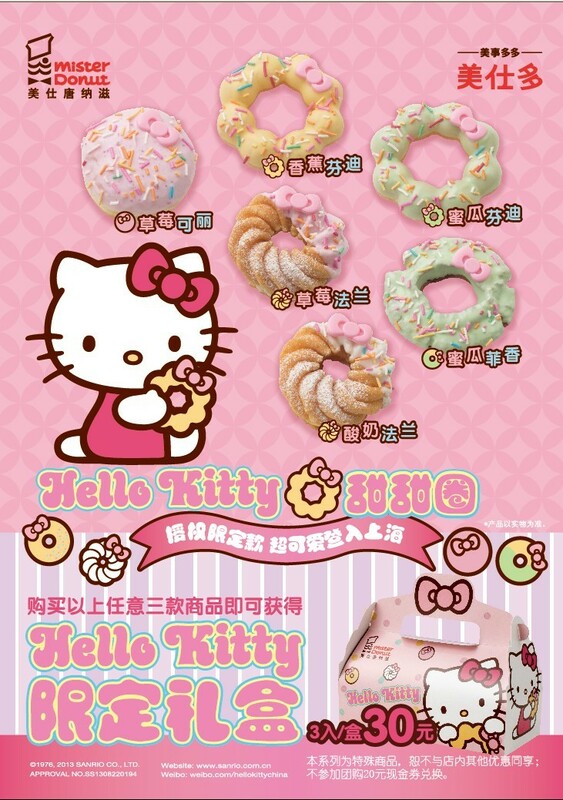 Cute Shanghai: Introducing Mister Donut's Hello Kitty campaign! Introducing Mister Donut's Hello Kitty campaign! From August 29 - September 25th, Mister Donuts across China will have the ambassador of cute, Hello Kitty, gracing their advertisements and turning up the cute level with limited time only extra cute and tasty flavors topped with Kitty's iconic pink hair bow. Purchase 3 donuts for 10 RMB each and you'll get this cute box to carry them in! The plastic bags they come in are Hello Kitty too! The event donuts come in 5 delicious flavors: strawberry, yogurt, banana, honeydew, melon and are all topped with an eatable Hello Kitty bow.